Well now this is the sixth of a series of broadcasts on the Seven Rules of Success. 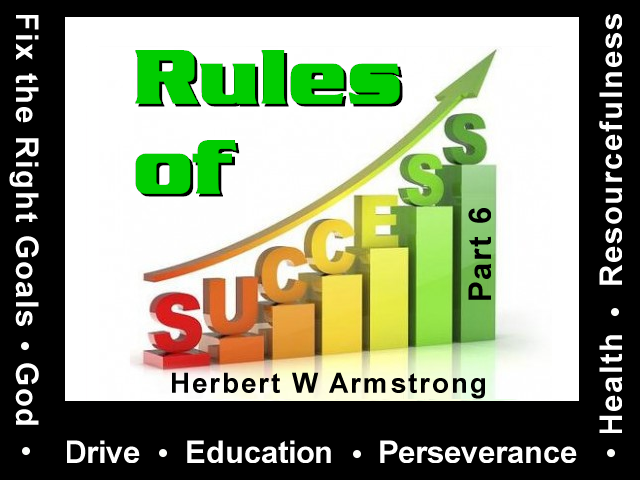 As I have said before, an altogether too large proportion of our people are not successful in life, because they do not apply a single one of the seven rules that bring success. Most people don't even know what those rules are. Now, as I have been going through for the past five broadcasts, the very first requirement for success is to fix the right goal. Which is just another way of saying that the first prerequisite is to know just what success really is. We've been going into that. Success means a lot more than the accumulation of money or of wealth. It means a great deal more than perhaps receiving the praise of men, and becoming a famous person in some manner, shape or form. It means a lot more than seeing your name plastered over the front page of newspapers and becoming very well known. I told you of the man I knew a little while back, the president of a large automobile manufacturing company. He was well known. He had accumulated money, fame, importance apparently, and yet he was frustrated, he was not happy and he committed suicide. That man was not a success. And so, as I have mentioned, to be successful in life, a person needs to be happy. He needs to be one who is free from the fears and the worries of frustrations. A successful person is one who is enjoying life now. A successful person is one who is living a full, abundant life. But he can't live that kind of life unless he knows what life is all about, unless he knows its purpose. I have gone through with you and showed you what the wisest man who ever lived did. He wanted to experiment. Now he had money, he had, what would be in today's money, billions upon billions of dollars at his disposal. He built great public works. He held back no pleasure from himself, as an individual, or as the head of a great nation. The man Solomon, king of ancient Israel. And he built, perhaps the building of the greatest splendor of any building that's ever been built on the face of the earth, that marvelous temple at Jerusalem. But all of the things that he went after to try to enjoy himself, and to indulge himself, he finally concluded was nothing more than grasping at a handful of wind. That's all, it didn't amount to so much after all. And so we need to know whether we were put here on this earth for a purpose, and what that purpose is. Now I've been going through that, and I was showing you in the last broadcast of this series how one of the best educated men who ever lived, a man who had really been around, he had traveled. And he was familiar with all of the philosophies of the men that were regarded as the top philosophers of the world at the time, and even those of past time, previous to his time. He knew what they were thinking, he was a highly educated man — the apostle Paul. And I was showing you, how, for instance, when he came to Athens he went up on Mars Hill. I've been there myself and seen the place. First he was down in the market place. Well the ruins of it are there now, and then Mars Hill up above it. After he had talked with men down below in the market place he went up, and there were these great philosophers sitting up there. And he mentioned to them how superstitious they were. They didn't even know why they had been born. They didn't know the real purpose of life. But the apostle Paul showed us what the purpose was. Your Bible shows you the purpose, and my friends, you can never find it any other place. Because, I tell you, that the scientists, the greatest scientists of the world have never been able to learn through their test tubes, or through their telescopes or their microscopes, or through any process of invention, exploration, investigation, anything at the hands at the disposal of science. They have never been able to learn why they were put on this earth, and what is the purpose of life, and what are the laws that produce success. What are the laws that make one happy? What are the laws that bring us peace? Now why don't we have peace in the world? Why don't we have peace in our homes? You know, some of the so-called greatest men in the world that people look on as successful, have no peace in their homes. Sometimes some of these great men are having nothing but trouble with their wives. And their children seem to rule the roost, and they can't even control their own children. And they are having troubles and frustrations right in their own homes. And the greatest statesmen in the world have never been able to bring us international peace. You know most people are not successful because they don't know the way. We don't have any peace on this earth because people don't know the way to peace. We have great lawyers, we have great statesmen, and men in politics, and men at the helm of great governments in this world. I wonder, do they really belong there where they are? Wouldn't you think that one of the great prerequisites to being the head of a great government, would be a man that knows the way to peace and how to preserve it? Well we think we know the way. Of course, here in the United States we think the way is that we just simply have to keep ahead of the other side of the world, in production of destructive weapons that can destroy everything. So that it serves as a deterrent so that they don't come over and destroy us. Well, according to one way of reasoning that may be necessary. But still do we really have peace? We don't really have peace, not when we have other governments, and men in them, that are like a lot of wild animals ready to spring at your throat any second, if you don't hold them at bay. Does anyone know the way to world peace? And how many of you know the way to peace in your own home, in your own households? Most of you don't even know the way. That's part of education. We don't know what the true values are, and we don't know what the real purpose of life is. And so I've shown you how the apostle Paul; let's just turn to it, I was cut off in the last program, I had to hurry through it rather rapidly, I didn't have the time that I would like to have had for it. Where the apostle Paul was showing the real goal in life. I'm going to cut it short and just go back to that because I want to go on to the next rule of success on past that. But here's what Paul was showing us. The Bible nowhere says that you have a soul inside of you, it speaks of you as being a soul. Man is a soul. And it speaks also of animals as being souls. And a soul in the Bible sense, going back to the Hebrew word which is 'nephesh', as it was originally written before there was any English language. It simply means the life of animals that comes through the breathing of air, and the circulation of blood in the veins. The oxidizing of the blood through the air that is breathed into the lungs, and the blood circulation through the lungs. That's the same in animals as it is in men. "That which is born of the flesh is flesh..." (John 3:6) But when we're born again, born of God, we'll be spirit, as God is Spirit. The spiritual image, but it shows very plainly that we are not now of the composition of God. We have only born the image of the material, physical, image of God so far, which is the image of Adam. And Adam then was only in the image of God in the physical sense as to form and shape. The same likeness, the same form, the same shape, the same as animals, begetting after their kind. And so it is, my friends, that Paul was talking about the resurrection. And the only hope given for any life after death anywhere in your Bible, my friends, is the resurrection of the dead. And you read here in I Corinthians — before I come to what I was going to, I would like to turn back to that just a moment real quickly. In I Corinthians 15 again. And the resurrection of Jesus Christ did not even occur on Sunday morning believe it or not. You know we believe so many fables, so many myths, that are absolute myths. And your Bible shows that Jesus Christ did not rise from the dead on Sunday at all. But when the women arrived there on Sunday morning He was already risen, He was not there. And Jesus Christ said He'd be in the grave three days and three nights. Well now I've mentioned that, that's rather a startling statement, and I know we have some new listeners that haven't been listening long enough to know that yet. And if that's rather shocking, why don't you write in for our booklet on 'The Resurrection.' because I can't take more time for it right now on this particular program. But write in for our booklet on 'The Resurrection.' That will explain it all for you, and there's no charge whatever. Be glad to mail you a copy. No charge. You aren't going to be asked for any money, one way or the other, but it'll certainly open your eyes. It's an astounding truth and you'll see it right in your own Bible. Well now look here, I Corinthians 15 beginning with verse 12. If there isn't any resurrection of the dead, and if you and I, and anyone who has been converted and received the power of the Spirit of God, and is in Christ; if they are not to be resurrected from the dead, then Jesus was not resurrected from the dead. And He upholds the whole universe by the word of His power. And I've shown you that the question that is asked there; What is man that God should be concerned about man? Little man down here like a lot of little ants running around on this earth. Get up a little ways in an airplane and they look like a lot of little ants. You get up a little higher and you can't even see a man. You can see the houses he lives in, as little tiny dots, or the automobiles that's just a little speck going down the highway. But a man, if he'd step out of the car, you wouldn't even see him he'd be so small. And yet God is concerned about man. Why? Well as I read to you here just a broadcast or two ago, because God has put everything under the feet of man, everything! No, because we haven't attained unto the resurrection yet. But we do see Jesus Christ with everything under His feet, and He said that "...All power is given unto me in heaven and in earth." (Matthew 28:18), after His resurrection from the dead, and before He ascended up to heaven. And here He is sustaining and upholding the whole universe by the word of His power, as you read here in the second verse of the first chapter of Hebrews, and where He is called very, very God. And one that has been born as God in a way that no angel ever could be. But He's the firstborn of many brethren, and those who are converted Christians are to be born as God the same as Jesus has been. Our vile bodies transformed and made like unto His glorious body, when His face is like the very sun shining in its full strength, His eyes as flames of fire. And we are to be like Him for we shall see Him as He is. He is just the firstborn of many brethren, and as I said before, we are to share His inheritance with Him. We are heirs of Christ, and co-heirs. Co-heirs along with Him and He has inherited a whole universe. That, my friends, is the purpose for which you were born. How many people know anything about the real purpose. The one goal in life then should be to attain to that resurrection. My friends, God doesn't want us to be unhappy and miserable. Some people think that God wants us to be poor. We have to give up everything worthwhile in this life, maybe we get paid off later, like an insurance policy that only pays off after you die. And you'll find the great old patriarchs of the Bible, the men who walked with God, they were prosperous men, every one of them. Yes, they had great possessions. It isn't wrong to have great possessions, if you know how to manage, and use it properly; to the honor and glory of God, which means to the good of yourself, and all other people alike. God wants us to be happy, but God set every law in motion. He set in motion the laws that bring peace, the laws that bring happiness. And we can have happiness and peace in our own homes. We could have happiness and peace worldwide. We could have prosperity where there would be no poor people, nobody starving, none of these things — if we knew the laws of God, if we knew the ways that God set in motion, and that He wants the people of this world to live. Oh my friends, I could tell you what I've seen about competition. The competition even among dignified business men. You know, it makes me think of a time years ago when I was beginning to develop a business of representing a number of banking magazines, and it started out putting on a special number, for one magazine. Oh this is more than forty years ago. And I was in Sioux City, Iowa, we were working up a special number for a banking magazine, and I heard of two little banks up in a little town in Iowa. Actually I had better not mention that town because this broadcast is going to be heard in that town and those banks are still there. I don't want to discredit anyone so I'll refrain from mentioning the name of the town. But I went up there because I knew that I could sell a full page to a bank up there. Now I wasn't converted when I did this my friends, I wouldn't do it today at all. That's one of the things I, it's business, and men do that kind of thing calling it business. Well I would know today that a Christian can't do this sort of thing, but here's what happened. In Sioux City, Iowa was a bank building construction company, who built bank buildings. And this same man, the same company, had built two bank buildings, there were two banks in this little Iowa town. One bank about twice as large as the other in its volume of business you know, in assets and liabilities, deposits, resources and all those things, and bank statement. Well at first he had built a building for this one bank. Now buildings didn't cost as much in those days as they do today. A dollar bought a lot more, and as I remember, that building cost eight thousand dollars. And if the bankers in that town are listening maybe they'll know where it is but nobody else will because even their customers don't know what their buildings cost them. And across the street was another bank and they kept watching this building jealously as it was going up. Nice modern, new little building but a quite small building that cost eight thousand dollars in those days. Well as soon as the building was through, the officers of the bank across the street called this contractor over there and they said, "Now if you don't mind telling us what that building cost, we'd like to know because we want you to build a building for us. We've been watching your work and we think, well... we're very well satisfied with what you did, and we know the bank over there is. Now we want to build a bank building, and we'd like to employ you to build one for us." And they said, "Do you mind telling us what was the cost of the building across the street?" "Well," he said, "Eight thousand dollars." Well the larger bank said, "Alright now, we want you to build us a building that will cost sixteen thousand dollars." So he did. Well this special number, I was getting banks to just buy a page just to show pictures of their new bank building. Nothing but pride and vanity. It wasn't going to do the bank any good actually. That's why I say I could not not sell it to them today, but I did then. Is there any among us my friends, that before he was converted didn't do things that he's hated afterwards that he would never do again? Well if there is, let him start throwing the first stone, that's all I have to say. Because this is one of the things that I am not now proud of. But you know, the greatest heroes in the Bible, and the men that God used to write it, had to tell in their own books that they wrote, the things that they had done in the past, that they were now so ashamed of. Well I went up there, I got up to the place, and I went into the larger bank, and I suggested that they take a full page ad to show their bank and all that sort of thing. Well they saw that it was of no value to them, as a matter of fact, it was just a case of vanity before all the other bankers all over the State would see it of course. But it wasn't going to really profit the bank. So of course they began to turn me down, one thing and another. Well before they could get that far I said, "Now of course this is an exclusive proposition. It goes to only one bank in a town. If you take it, why no other bank in this town could get it." In other words they knew that the bank across the street would do it if they didn't. And so out of jealousy, and to prevent that bank from getting it, they sort of winced, and they said, "How much is it?" And I told them how much it was and they said, "Well alright, we'll buy it." And so of course they did. Well I knew that was the way it was going to work out, or I wouldn't have gone up there. Even among dignified bankers, my friends, there is this spirit of jealousy and of rivalry, of competition. You'll find it among bankers, the same as you find it among filling stations on the corner, among any kind of store. You find competition in all kinds of business. And do you know that you find it in almost every walk of life, even in religious life my friends? But that is of the flesh and it doesn't make anyone happy. You know if we can get rid of those things we're better off. Party spirit. Party spirit. I am of this party and against people of the other party. My friends, that's not God's way and it's not the way that makes people happy, but it is the way of this world, and it isn't bringing us peace. Now there's the way of natural flesh and inclination of man. But here the Spirit of God means this; the fruit of the Spirit that is produced by the Spirit of God, if you are a converted person, here's what you'll have. First of all is love, you just simply have love for all people, even your enemies. And the next thing you'll have is joy, and joy is happiness just brimful and running over, and you'll be filled with joy — if you really have the Holy Spirit. Now how many people are converted? Everyone who is really converted my friends, has these things. He is filled with love. Not his own, the love of God shed abroad in a human heart by the Holy Spirit of God (Romans 5:5). And God gives His Holy Spirit only to those that obey Him (Acts 5:32). You've got to surrender first. You've got to be conquered by God until you don't go the way of people. You don't look to the way of your party, your clique, your group of people — but what does God say? You're living by every Word of God, total surrender to God to obey Him. Then you can have His love shed abroad in your heart by the Holy Spirit and joy. And the next is peace. There isn't much of that on this earth. There isn't much conversion on earth. And next comes good temper, or patience. And then kindliness, and then generosity, and next fidelity, dependability, then gentleness, and then self control. Oh my friends, there is the way to success. There is the way to happiness. Yes there it is, there's the way that is going to lead you into eternal life, and it's going to make life happy and abundant here and now. And it'll make you a blessing to everybody else, and you'll be making others happy. Now if you have a right goal my friends, and as I say, there has to be a sub-goal, you have to earn a living, and you should be where you fit. Everybody is not fitted for the same job, but have a right goal first. Now what is the second of the rules of success? I am going to tell you and I'll have to go into it in the next broadcast. Second is right education, or preparation for it. Well now listen, I want you to write in for this booklet on 'The Seven Laws Of Success.' You need to get that. Why are not more people successful? And then, have you ever seen actual proof that God exists? Could you prove it to anyone who would ask you for proof? Why don't you write for this booklet on 'Does God Exist?' proving that God exists? Just write for 'Does God Exist?' Now there's no charge whatsoever, I'll be happy to send it to you wherever you are, any place around the world. And then the Plain Truth if you are not on the mailing list. Remember there is no subscription price to you, your subscription has already been paid, there's no charge. Now write for that booklet 'The Seven Laws Of Success.' and your subscription to The Plain Truth. So until next time, "Goodbye friends."